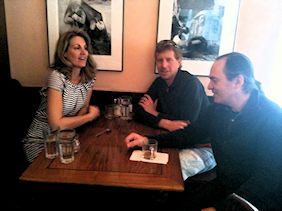 J.J. and I hit the road last month ... driving down to my old stomping grounds, San Francisco! College Ave. Storefront ... So Proud of Her! Had a great time catching up with my early mentor, David Sibbet from The Grove Consultants. Then over to Oakland to play with Lesley Evers (we both worked as Graphic Recorders with David back in the day). When I say play, I mean PLAY ... Lesley is a clothing designer now and it's pretty much a dream come true to play dress up as your friend pulls one amazing design after another straight from her racks. 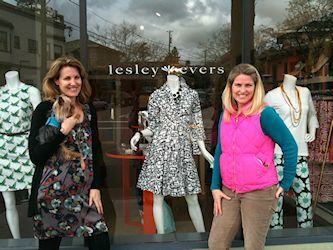 If you see me in person, chances are I'm wearing a Lesley Evers design. Bold, great lines, and a little bit cheeky (just like Les!). Another stroll down memory lane was meeting up with two of the smartest (and nicest) men I know ... Tim Clark and Paolo Salvagione. Many moons ago I drew out their Visions on mural paper taped to shipping containers on the Sausalito docks. Now all of us are living the dreams of our more youthful days. Such a treat to watch fascinating people develop over time. All so supportive of each other with deep appreciation of our unique talents. Love you guys! 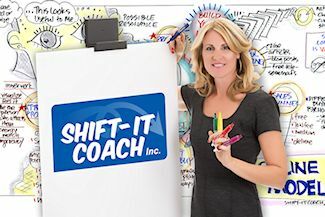 In addition to the trip, it continues to be a busy season here at SHIFT-IT Coach, as the 2013 Cohort for Visual Coach Certification launches and we squeak in a new offering "Biz Basics for Process Professionals" before I take my month off in August. This edition's article is on the 7-stage "Outer Work Model" that the new class is centered around. P.S. Our bricks & mortar expansion continues. FYI, we are currently interviewing candidates for a Part-time Office Manager in Victoria, British Columbia, Canada. Apply if you fit the bill or pass along to others who might. "I AM FOREVER GRATEFUL. THANK YOU FOR BEING SUCH A GREAT INFLUENCE IN MY LIFE." "Christina, I want to thank you for our brief, but oh so powerful, conversation a couple years back when I was outreach for Graphic Facilitators. In those brief moments you asked me if working for the government facilitating projects with the likes of the Army was really what I wanted to be doing. That, it sounded like supporting startups and entrepreneurs is what excites me. You said, "I hear in your voice you really are into your entrepreneurship programs why aren't you doing more of what motivates you." Your words and intention stick with me and I am forever grateful because those words caused me to pause long enough and focus on sticking to my purpose and where I add the greatest value possible. For Consultants, Facilitators, Coaches, Content Experts, Scribes, Artists, etc. Developing one's craft is only part of the puzzle in having a successful solopreneur practice or small business --- to understand and successfully implement solid business strategies are another. Previously my 'Outer Work' model to create and maintain (or revamp) a venture in the 50-300K range has only been available to students in our longer-term masterminds. Now this practical and much needed info is offered, for the first time ever, in a condensed online format. Topics include: inspiration, identity & brand, structures & banking, offerings and proper sales funnel creation, sales & marketing (including social media), pricing and effective collection policies, tech and administrative support (team building), bookkeeping & accounting, and partnering and joint ventures. And, the positive mindset and resilience that underscores it all. Over 87% of your facilitation, coaching, training and consulting clients are visual thinkers – learn powerful visual skills to boost the effectiveness of how you work with them. 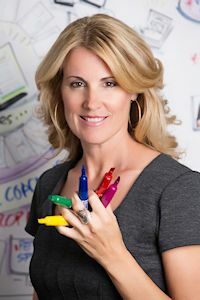 This professional skills training thoroughly covers custom chart work, visual scribing, visual facilitation and visual coaching (the four main applications of working visually with groups and individuals) so you can add these powerful tools to your own consulting, facilitation, coaching and training offerings. In-person version only offered once a year, so act fast to claim your spot. * Note: Pre-requisite for Visual Coach Certification and Magic Marker Mastermind. Keen to integrate the visual way of working into your consulting, , facilitation, training or content rich business? On the fast track to becoming a Visual Facilitator, Coach or Scribe? Christina Merkley has limited availability in 2013 for private business coaching and visual skills apprenticeships customized for your unique needs. Get the power of a highly skilled and supportive visual pioneer working one-to-one on your success! * Exploratory Chat with Christina to discuss your goals and determine which package best for you. Email [email protected] to book. I've run my own biz for over 12 years now. When I started, I was excited but scared as heck. Along the way I have learned A LOT about not only how to survive but how to thrive doing what I love. For years I've taught and mentored others in how to do the same through private coaching and our various courses, particularly the longer term masterminds. 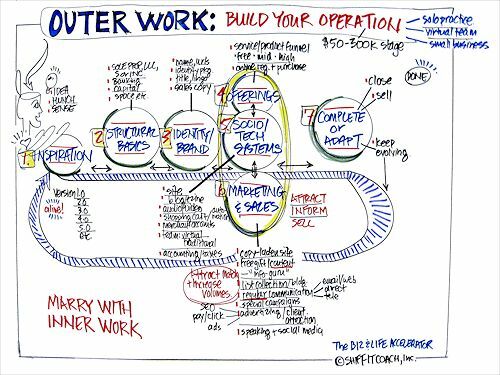 I want to share briefly with you what I've coined my "Outer Work Model" ... the seven stages for building an operation in the 50-300K range. It all begins with Inspiration ... the idea, hunch or urge that niggles at you ... the thing that wants to manifest through YOU. If you are new to self-employment or entrepreneurship, it's the craft, practice or business that you want to launch (even if you are apprehensive, nervous or downright scared ... and don't know yet how to do it). If you are already in business, it's the thing that now wants to be birthed ... the evolutionary whisper, rumble or shout that urges you to change, transition, or revamp; even though, or sometimes because, you inhabit a nice comfort level ... but part of you doesn't want to stop there because it knows there is more for you to evolve to and it wants you to GO FOR IT! Embedded in Inspiration is rich data about your emergent Identity and Brand – who you are as a practitioner and leader and what your 'IT' is. This stage can take some time, so it's important to be patient and let the creative process do its work. After wrestling (and doing good exercises of assistance) you extract what your business identity truly is (at this point in time) You realize how authenticity, congruency and 'being who you really are' serves not only your soul but powerfully attracts your Ideal Client too! With a clear identify and brand (or at least clearer ... cause you must get used to acting before total perfection sets in) your focus now turns to the Structural Basics that create a secure foundation for your business. 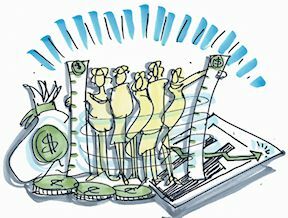 The legal, banking, bookkeeping and accounting "Must Haves" ... that create a strong girding for the services and/or products that you offer your Ideal Clients. Decide on a beginning biz structure (sole prop, LLC, Inc.), where to bank, find appropriately skilled bookkeeping & accounting professionals to assist you ... all the basics that you'll need to conduct biz from. Through this process you will develop the sense of your biz being a separate entity from yourself (because it is!). From your identity and brand work you know who you truly are and the clients you serve. Next, you need to get very, very clear about what your offerings to them are (the service or products that you provide as solutions to their needs or problems). Again, you must exert patience as you likely will not be able to instantly do everything that you want to ... building a proper sales funnels takes time. Start with the obvious, low-hanging fruit. What are the one of two services and/or products that you can immediately focus on? Then strategically continue to add to those over time. New offerings emerge from your client base, as knowing your market impacts what you offer them next because you intimately know what they need and want. Yes, you have built Structural Basics into your Business but you also must consider the role of Socio-Tech Systems too --- the people (virtual contractors or in-person employees) and technology that help you effectively serve your clients (web tools: sites, blogs, stats, security, software, hardware, payment options, automation aids, etc). Where you play (or want to) on the 50-300 scale determines the extent of the people and tech systems you need. Like offerings, start simple and build from there. You don't have to do it all this Red Hot Minute ... chill and take an evolutionary approach to your system building. The size of my own operation and team has snuck up on me over time ... gently growing alongside my offerings (and very connected to my own personal development as a practitioner and leader ... change happens first on the inner then manifests on the outer). For some these are dreaded words ... and I was a bit leery of them too when I began. But FYI, Marketing & Sales is a necessary part of any business and from personal experience I can assure you it can also be fun and enjoyable (even for those who are naturally shy). It's a matter of starting exactly where you are and with those in your immediate network and branching out from there. Plus, in this incredible day and age there are wonderful tools that no other generation in history has had good fortune to have at their fingertips (the internet and social media!). Old school ways still work, however if you have web or tech phobias you must deal with them or at least partner with people who are comfortable in these realms – otherwise you will miss out on incredible ways to link your offerings up with the folks who truly need them. Stage 7: ADAPT OR CLOSE? Business is an organic, alive process. You may operate for years but one day reach a crossroads … decide whether to keep going and make adaptations (cycle thru model again with a refined inspiration) or to close shop. Alternatively, it may be time to bring a 'conscious death' to your biz if your inspiration has run dry. Far from taboo, the discussion of the death of your biz could lead to the birth of a new one, or blossom other areas of life instead. . The seven Outer Work stages I have just outlined are essential and practical ... however there is a secret sauce that runs underneath all of the others. And that is the cultivation and nurturance of a Positive Mindset and the stance of Resilience. Its normal when you are first starting out (or revamping) to be nervous, apprehensive and do a bit of avoidance or procrastination on your biz building. However, you can't allow that to fester and keep you from implementing your steps. You must learn the art of emotional mastery ... how to accept your emotions yet also how to effectively move yourself up the emotional scale so you don't take yourself out before you have even begun. Such a shame if you allow your fears, resistance and discomfort to keep you from getting your "IT" out there ... as our world needs as many aligned, productive and successful Process Professionals as it can get! From my own experience I can tell you that nothing beats the sweet feeling of having faced your dragons and done it anyways! There have been many times when things felt scary, confusing and overwhelming, but having this model and consistently implementing it have got me to where I now am (and to the phase my company is now going through ... moving from primarily an online biz to brick & mortar (creating an office hub here in Victoria with in-person employees in addition to our wonderful online team). For those that this article speaks to, I say 'go for it and keep on going'. Hopefully I've given you some ideas and some inspiration in these paragraphs to feed you on your path. New Upcoming Course: FYI, for more in-depth mentorship with me on how to build your 50-300K practice, with the support of other like-minded people across the globe also doing the same, check out our new Biz Basics for Process Professionals course. Fully online (so you can take it from the comfort of your own home no matter your geography). Yes Virginia, There Is A Santa Claus ... You!